Terminal Ileitis is considered as a chronic inflammatory disease that affects very end of the small intestine (terminal ileum), the part of the small intestine closest to the colon, making it narrow. This disease starts with the formation of ulcers in the small and large intestines. Terminal ileitis is generally caused by interactions between environmental, immunological and bacterial factors in genetically susceptible individuals. As a result, there is a formation of inflammatory disorder, where the immune system of the body attacks the gastrointestinal tract possibly directed at microbial antigens. Many people with terminal ileitis have symptoms for years prior to the diagnosis. There are chronic recurring periods of flare-ups and remission. Various conditions such as ulcerative colitis, intake of non-steroidal anti-inflammatory drugs, infectious diseases etc. may be related to terminal ileitis but it commonly referred to as crohn’s disease. To a correct therapeutic approach, it is necessary to understand the causes of this inflammation process. Terminal ilelitis is a non-specific inflammation of the terminal portion of the ileum which sometimes spreads to the cecum causes ulceration of the intestinal mucosa, thickening and retraction of the intestinal wall. The diagnosis is based on the exclusion of the specific infective process in the ileum such as ileo-cecal tuberculosis and actinomycosis. What are the Symptoms of Terminal Ileitis ? The signs and symptoms of terminal ileitis can range from mild to severe. They usually develop gradually but sometimes will come on suddenly without any warning. What are the Causes of Terminal Ileitis ? It makes no difference whether it is triggered by an auto-immune reaction against the cells of intestinal mucosa, the failure of the inherent defence against enterbacteria or an inflammation caused by specific viruses or bacteria. 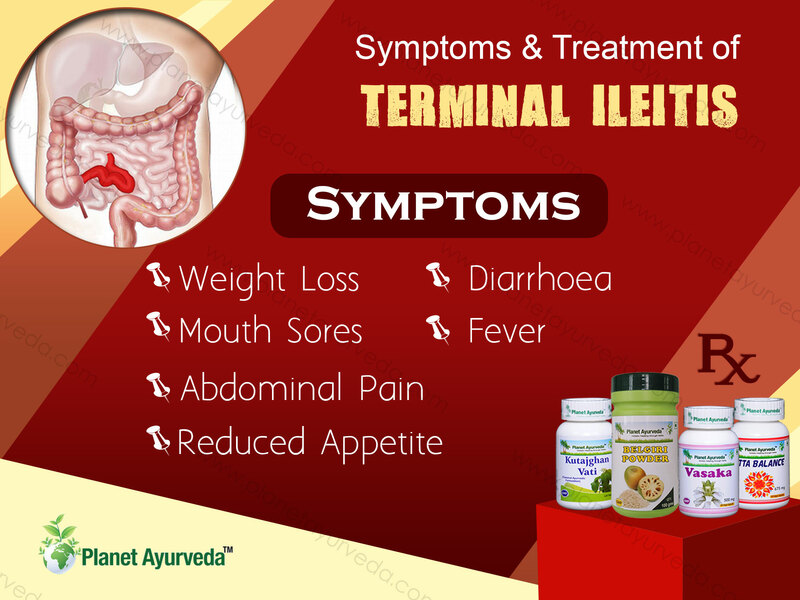 According to Ayurveda, improper lifestyle is the main reason behind the development of terminal ileitis. Toxins known as “Ama” in Ayurveda accumulate in the gastrointestinal tract due to wrong eating habits. In addition, stress and unstable nervous system aggravate the disease. Ayurvedic treatment involves the elimination of toxins as well as balancing of daily nutrition. In this disease, it is important to bring all natural regulatory principles back into harmony. Stambhana (ayurvedic formulations that stop the movement of elimination, when there is bloody diarrhoea with normal appetite). The inflammation reduces the absorption of Vitamin B12 and other bile salts. Inflammation of the small intestine impairs the absorption of all the necessary food nutrients. Inflammation of the intestine impairs water absorption causing diarrhoea. Planet Ayurveda offers herbal remedies that cures the condition by using herbs, control the inflammation and corrects the abnormal response of the immune system. 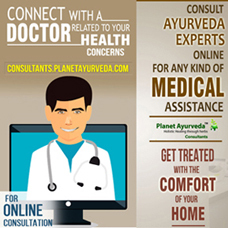 These herbal remedies by Planet Ayurveda help in the natural repair of the damaged tissues. Kutajghan Vati has anti-diarrheal, anti-dynsentric, haemostatic and anti-amoebic action. It is highly beneficial in diarrhoea, intestinal infections, dysentery and bleeding disorders. It provides good relief in chronic diarrhoea as well as in terminal ileitis. It reduces ‘ama’ or toxins formation, mucus content in stool and also checks bleeding. Dosage: 1-2 tablets twice daily. Belgiri Churan of Planet Ayurveda is prepared from bael – Aegle marmelos. This fruit is known as Bael in Hindi. This fruit is rich in the nutritional fibre known as pectin. It provides relief from the inflammation, pain, ulceration and many other gastro-intestinal problems. This churan works wonderfully against diarrhoea, dysentery, ulcerative colitis, terminal ileitis etc. This fruit also possesses immunomodulatory properties. Digestion, metabolism, formation of new cells in the body are controlled by the digestive fire in the body known as Pitta. In terminal ileitis, there is an imbalance of pitta dosha in the body. To pacify Pitta dosha, Planet Ayruveda has manufactured Pitta Balance capsules that help in balancing Pitta dosha in the body. It is a combination of cooling compounds, natural calcium compounds to restore the pitta imbalance quickly. The herb Vasaka is known as Malabar nut tree. This herb possesses anti-bacterial, abortifacient, anti-dyspesia and wound relieving properties. The bark, root, leaves, fruits and flowers are useful in the removal of intestinal parasites. The juice prepared from its leaves are useful in relieving diarrhoea and dysentery. It is considered as a cooling herb and is very useful in stopping blood in the stools. This herb balances Pitta and Kapha doshas in the body. Of all the herbs which are used in bleeding disorders, Vasaka herb is the best. Include buttermilk with curry leaves regularly in your diet. Avoid spicy foods, alcohol and smoking. Avoid fatty and fibre rich foods as people with terminal ileitis have a narrowed small intestine, they need to eat a low fibre diet. Avoid using painkillers on your own. Drink water boiled with carminative herbs. Include pomegranate juice and coconut water in the diet.